The immersive, full-sensory virtual driving experience is controlled by 30 emotional, cognitive and physical inputs to create a unique environment with landscape, color and music changing in real-time to reflect the driver’s moods. It is inspired by the brand’s performance technologies that define the Acura driving experience. To experience Acura “Mood Roads,” guests will enter a spherical motion simulator equipped with a performance driver’s seat and 30 biometric sensors, measuring 24 integration points including the user’s brain waves, heartbeat and facial expressions. Once buckled in, guests will embark on a journey customized and based on the driver’s mood as interpreted by the biometric sensors. 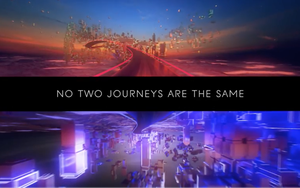 Created by AOR MullenLowe with an assist from George P. Johnson and Spinifex Group, “Mood Roads” takes each guest down a virtual road in an abstract environment, bringing to life the road’s curves, twists and turns through the motion simulator, all responding in real-time to the driver’s emotional, cognitive and physical inputs. The visual journey is viewed by the driver as a large projection on the inside of the “Mood Roads”sphere, accompanied by music specifically composed for differing experiences and other sound effects inspired by Acura vehicles, including the NSX supercar. It is a highly personal 90-second journey with no two experiences being identical. Consumers at other festivals or auto shows might be able to experience “Mood Roads” in the future, says Jessica Fini, manager, Acura new media strategy and activation. Acura is a presenting sponsor and official vehicle sponsor at the film fest which runs January 20-28. This is the automaker’s seventh year sponsoring the event. The immersive experience for guests who check into the Festival Village Presented by Acura begins with signing up for a custom-branded RFID wristband, which enables attendees to check-in throughout the village, capture sharable social content and view the 2017 Acura NSX on display. Outdoors, guests can experience performances on the Acura Stage. Celebrity guests who visit the Acura Studio at the festival will sign the hood of an NSX mounted in the press junket space to benefit the Pediatric Brain Tumor Foundation. Also on display is a full-size NSX ice sculpture.